One of the most frequently asked questions at my deer calling seminars is "What type of calling should I be doing: grunting, rattling, bleating or something else?" I always answer, "If you want to be consistently successful you should be grunting, rattling, bleating and something else - But only at certain times." A key to effective deer calling is matching your calling strategy and tactics to specific whitetail behavior at the time of year you're afield. You wouldn't greet everyone at a party by shouting "Fire!" would you? And you wouldn't wake your family up the morning of July 4th to celebrate Christmas would you? The same holds true for deer calling. 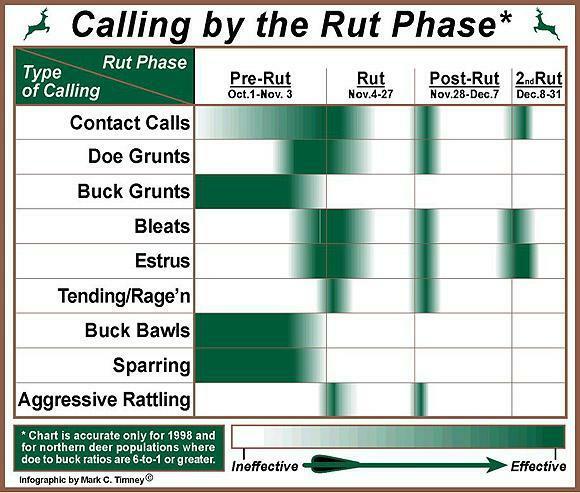 The chart above, "Calling by the Rut Phase," illustrates the general effectiveness of a wide variety of calls and should make choosing the right call much simpler. 3. Tactical suggestions for their use in the field. There's obviously a lot more to deer calling than this, but these two charts provide most of the basic information you need to get started. After reviewing this information and trying it in the field, I think you'll find that `deer talk' is a relatively easy form of game calling to master. You may notice that I've left out information on rattling My next column will address that subject in detail, particularly on how you can make your rattling sequence sound even more realistic. Also known as the `lost call,' this sound is a doe's way of locating other members of her family group when she's become separated from them. Two or three loud calls with a :15 - :30 second pause in between about every 15 to 20 minutes. Works great to cover noise if you're still-hunting. Grunts are a deer's way of saying "Hey... come here." It's critically important to keep the call soft as a loud grunt means "HEY!!!!!" and is too aggressive unless you're doing it in conjunction with rattling. Blow one to three very soft grunts with slight pauses in between, every 15 to 20 minutes. A buck grunt is of a deeper pitch than a doe's, but means the same thing. The older and bigger the deer the deeper in pitch the grunt. Blow one (and sometimes two) soft grunt every 15 to 20 minutes. Bleats can be translated as meaning "Here I am," and does typically use them to keep their family groups together and to call their fawns to them. One to three moderately soft calls with slight pauses in between every 15 to 20 minutes. This is a combination of a series of estrus bleats topped off by a guttural moan. It signals that the time to breed is RIGHT NOW! A louder and longer bleat that does typically make to signal that breeding time is very near. Blow one to three moderately loud calls with slight pauses in between every 15 to 20 minutes. This is a series of soft grunts that bucks often make while trailing does as the rut approaches. It's his way of asking her to stop so he can breed her. Seven to 15 or more soft grunts in rapid succession. This call works well if you're on the ground and moving through the leaves. This sound is just now being classified by biologists. It's made by buck's during the `delight phase' of courtship when the doe has stopped running, but still won't breed. It's a non-aggressive call that signals a bucks frustration with the situation. This series of sounds can be repeated one or three times every 15 to 20 minutes. This is really a buck bleats, and it sounds a lot like a calf bawl. It typically signals a bucks desire for company. Blow with moderate strength one to two times every 15 to 20 minutes. Use in conjunction with sparring early on, and alone during the late season. This a non-aggressive, social activity that bucks engage in to prevent serious fights later on. It's akin to two small boys wrestling for fun... no one gets hurt but both eventually learn who can `whip' the other. Sparring matches can last from :05 seconds to over two minutes in length. Add in a few soft grunts for extra realism.